Redondo Beach, Calif. (August 4, 2017) –Smooth bourbon, mouthwatering barbecue and breathtaking views take center stage at Shade Redondo Beach’s premier Bourbon, Blues and BBQ event, hosted on the hotel’s open air Skydeck on Saturday, August 19 from 7:00 p.m. to 10:00 p.m. The country themed event will include an unlimited barbecue feast, one complimentary bourbon or vodka cocktail and a live blues band. A full cash bar will also be available. The menu, created by Sea Level Executive Chef Aaron Robbins, will feature savory dishes including All-American barbeque favorites: Pig on a spit- pulled pork sliders with bourbon apple slaw; ribs with a pineapple bourbon BBQ sauce and BBQ Chicken. Guests will get to indulge in Southern comfort food staples including fresh baked beans; mac-n-cheese; mini corn on the cob on a stick and grilled peach salad with arugula, farro, blueberries, red onion, blue cheese, pistachios, and maple bourbon rosemary dressing. To complement the Southern inspired menu will be the bluegrass sounds of Los Angeles band, The Fancies and a selection of top shelf bourbon including Bookers and Bakers. Tickets for the 21 and over event are $55 per person and are available for purchase at bourbonandbbq_RB.eventbrite.com. During the event, Sea Level Restaurant will be open to guests of the hotel and to the public for dinner. To make a reservation please call 310-921-8950 or visit www.rb.shadehotel.com for more information. Shade Hotel is located at 655 N. Harbor Drive, Redondo Beach, CA 90277. 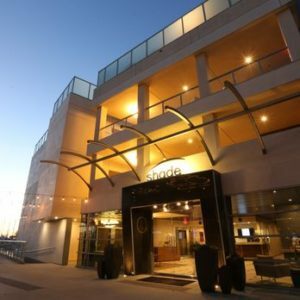 Shade Hotel, the waterfront luxury boutique hotel on the forefront of the Redondo Beach Waterfront Revitalization Project, is in the vibrant coastal community of Redondo Beach and serves as the premier destination for guests in search of the quintessential Southern California experience. Located just 7 miles south of LAX, the property features a serene, contemporary setting enhanced with natural elements of sand and stone, calming color palettes of blues and greens, and a living succulent wall. The property offers 54 luxurious rooms with picturesque views of the marina and opulent amenities such as Tempur-Pedic beds and Chromotherapy lighting. For meetings, sophisticated board rooms are available and are equipped with built in state-of-the-art technology and open-air patios. The rooftop Aquadeck offers a private pool and bar, and stunning views of the ocean and horizon. Adjacent to the main hotel building is a 9,034-square foot fully-dedicated event building with expansive indoor/outdoor space for weddings and events and houses the notable waterfront dining destination, Sea Level Restaurant and Lounge. Shade Hotel is an ideal location for luxurious seaside getaways, dream beach weddings, business meetings or special occasions.